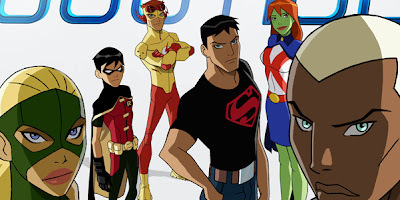 Toy Fair provided our first glimpse of what's to come from Mattel's Young Justice toys, but we now have the confirmed lineups for the first assortment of 6-inch and 4 1/4-inch figures thanks to Entertainment Earth. These 6-inch DC Universe Young Justice action figures are hyper-articulated with animated styling from the Young Justice animated series on Cartoon Network. This series is sculpted by the Four Horsemen and builds upon the award-winning world of 6-inch DC Universe Classics figures. Each figure will come with a dynamic display stand inspired by a scene from the animated series, as well as the most accessories we have ever produced and will give fans limitless display options for their collections! These 4 1/4-inch tall figures are perfect for the continuity with existing Justice League Unlimited 4 1/4-inch tall figures. Young Justice figures will feature the same articulation as Justice League Unlimited, but design and styling will be inspired by the Young Justice animated series on air on Cartoon Network. Each figure in the 2-pack will come with an individualized display stand which will feature character ID and bio information. Figures in the 2-packs were chosen to create mentor/mentee pairings giving fans show-to-shelf storylines in each pack.